Three time Kentucky Derby winner Gary Stevens has ruled out further comebacks after an MRI showed his vertebra up against his spinal cord. This ends a racing career that includes 5,187 victories, more than $258 million in purses and three trips to the winner’s circle in each of the 3-year-old classics: the Kentucky Derby, Preakness and Belmont Stakes. “I’m done doing what I did,” Stevens told the Daily Racing Form. “I was getting close anyway. Now it will be time to pursue other things, but thank God I’m not in a wheelchair. His racing career ends 30 years after he won his first Derby aboard D. Wayne Lukas’ filly, Winning Colors. Lukas won his first two Derbys with Stevens aboard Winning Colors (1988) and Thunder Gulch (1995) and the last of his six Preakness victories with Stevens riding Oxbow in 2013. Stevens also won four of the 3-year-old classics while working for trainer Bob Baffert, narrowly missing the Triple Crown aboard Silver Charm in 1997. Stevens won the Derby and Preakness with Silver Charm, but lost the Belmont to Chris McCarron and Touch Gold by ¾ of a length. Six years later, Stevens (portraying jockey George Woolf) defeated McCarron in Seabiscuit, when Hollywood recreated the 1938 match race between Seabiscuit and War Admiral. “The thing about him is that he’s extremely talented in so many areas,” Lukas said. “The fact that he could ride and he stars in a movie, for crying out loud. He had so much talent and so much going for him. 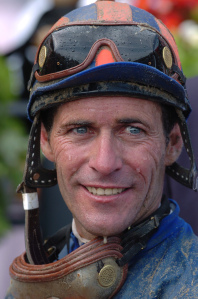 Inducted in thoroughbred racing’s Hall of Fame in 1997, Stevens rode in the Derby 22 times, and is the last jockey to win the race with a filly (Winning Colors).